Company D marching on Main Street in front of the courthouse, September 1917.
heading to the train depot to leave Kerrville for the last time. Francisco Lemos and Sidney Baker are in this photograph. Ruth Hamilton remembered how cold and clear it was in Kerr County on the morning of Monday, November 11, 1918. She lived a little over a mile from Kerrville, and when she and her family heard the downtown fire bell ringing, they thought a house was burning. The sound of the bell carried so well on the cold air, she recalled. It was only after the church bells all over town began ringing did the Hamiltons realize something unusual was going on, but it wasn't until the telephone rang that they understood what had happened. Germany had surrendered, and the First World War was over. 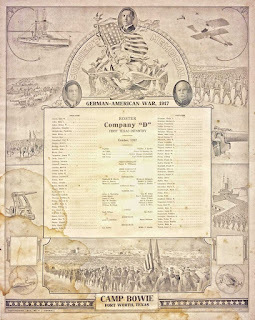 "When the Armistice was signed on November 11, 1918, telephone operators spread the word, especially to families that they knew had sons or husbands in France. Up on Johnson Creek the word spread, but the wait seemed endless before Dr. Luther Fawler received his San Antonio Light and we could see the news in print." The newspapers from San Antonio arrived in Kerrville by train, and then had to be carried on to the subscribers' houses, often delivered by horse-drawn wagons, even in 1918. As the news quickly spread through Kerr County, people gathered together, many of them in downtown Kerrville. "The glad news that the gigantic armies facing each other on the long battle front in France had agreed to an armistice reached Kerrville early in the morning of November 11, 1918. Soon after dawn the noise of celebrating began and the din brought people into town by the hundreds. Before noon downtown sidewalks and streets were packed with people and automobiles driving up and down the thoroughfares. Everybody was wildly hilarious with joy. "Guns were fired, whistles were blown and bells were rung. Schools were suspended for the day. The old town fire bell ... played its part in the noisemaking. Men and boys climbed up the tower after breaking the rope used for ringing, and with hammers kept the bell clanging for hours." And yet, for all of the joy the community celebrated, there were three families for whom dark news was still to be delivered, news coming to them slowly from France. 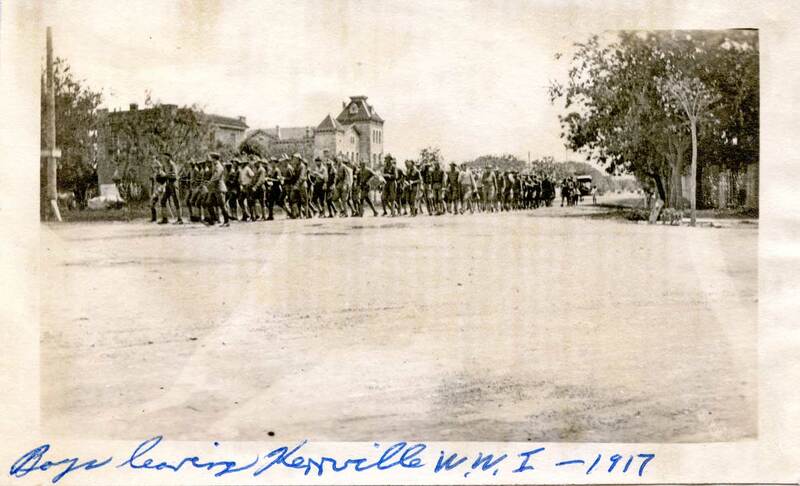 "When Kerrville was celebrating the first Armistice Day," Bennett writes, "the citizens were unaware that three of the city's noble youths who had volunteered for their country's service had given their all. Mrs. E. W. Baker [the mother of Sidney Baker] received the news of her son's death the very next day, November 12. Later in the month, Judge and Mrs. W. G. Garrett received the information from the War Department that their son, Earl, had lost his life. Relatives of Francisco Lemos also received the news of his death in late November." There are 19 Kerr County men listed on the war memorial on the courthouse lawn. Of those listed, three died in battle in France: Francisco Lemos, Earl Garrett, and Sidney Baker. 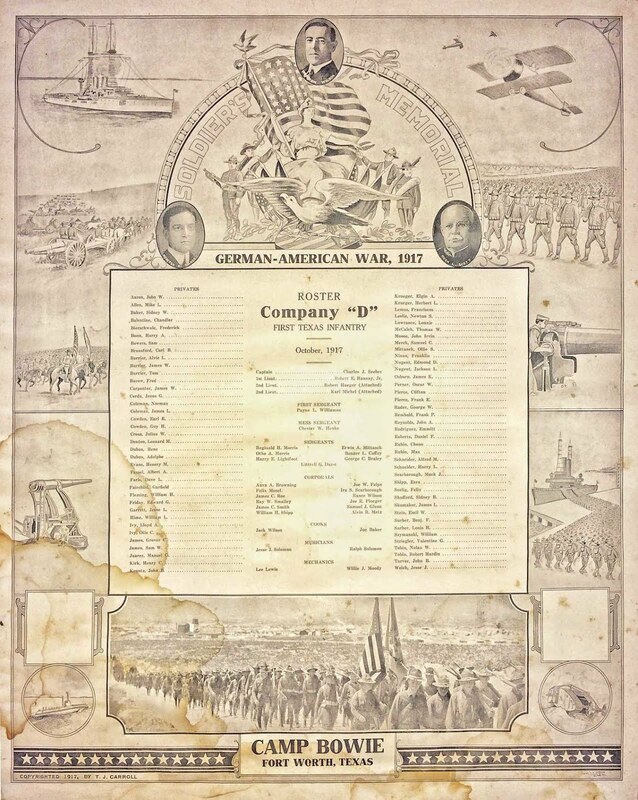 Many of the other soldiers listed there died in Texas and in France during the influenza pandemic of 1918, which killed at least 50 million people worldwide. On this day 100 years ago the guns were finally silent and celebrations began, even among families who thought their boy had survived and was coming home. The sacrifices of our soldiers and their families in that war can seem dim to us after the passing of so many years, but to them those sacrifices were tragic and heartbreaking. We remember three of those heroes because major downtown Kerrville streets were renamed in their honor. The other 16 we do not easily remember, though their bravery and willingness to serve our country was just as great, and the loss their families suffered was just as deep. Joe Herring Jr. is a Kerrville native who finds some columns more difficult to write than others. This column originally appeared in the Kerrville Daily Times November 10, 2018.